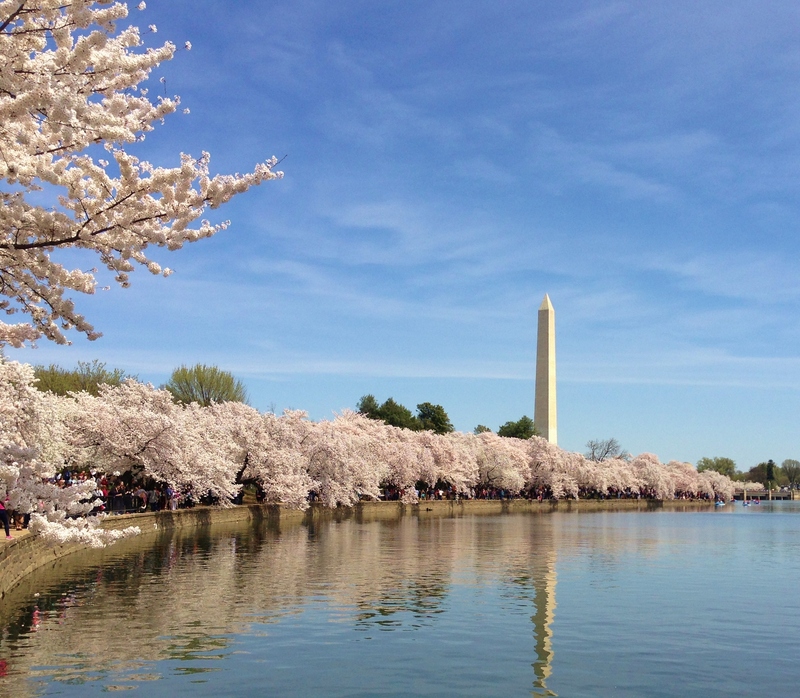 Throughout the DC area, the blooming of the cherry trees in our nation’s capital is a much-discussed topic beginning in late February or so. 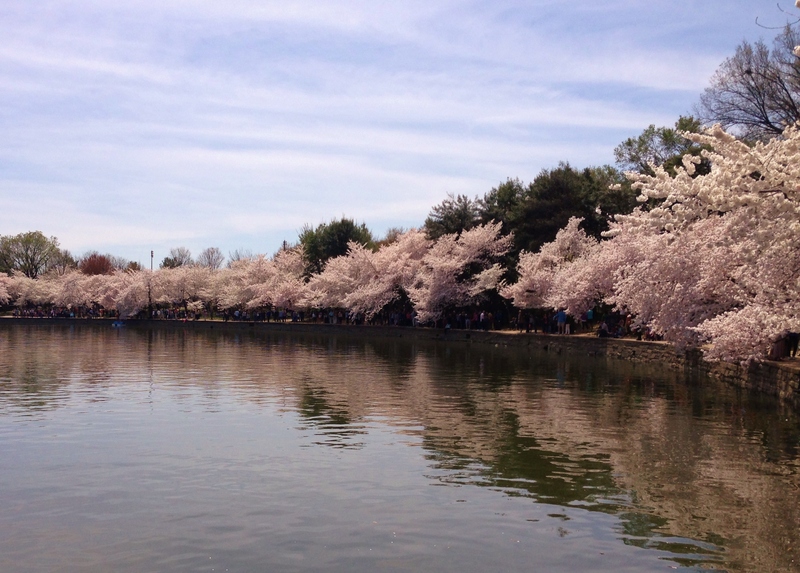 Will the bloom coincide with the actual Cherry Blossom Festival? Usually not, but there is always hope. Over 3,000 trees, a gift from Tokyo during the Taft administration in 1912, border the Tidal Basin near the Jefferson Memorial. At their fleeting, elusive peak, they are a truly remarkable sight. It’s a sight I can’t recall seeing at close range during the nearly seventeen years we’ve lived in Northern Virginia. My husband says we were there once pushing our new baby in a stroller, but I have no recollection of the visit and no photos to prove it. Our daughter certainly has no memory of it. Once, on our way to Atlanta for Easter, she and I saw the pink fluffy trees as our plane followed the line of the Potomac on takeoff. In the spring of 2008 we were at the Tidal Basin, with our daughter and puppy, about ten days too late, as the photo below shows. 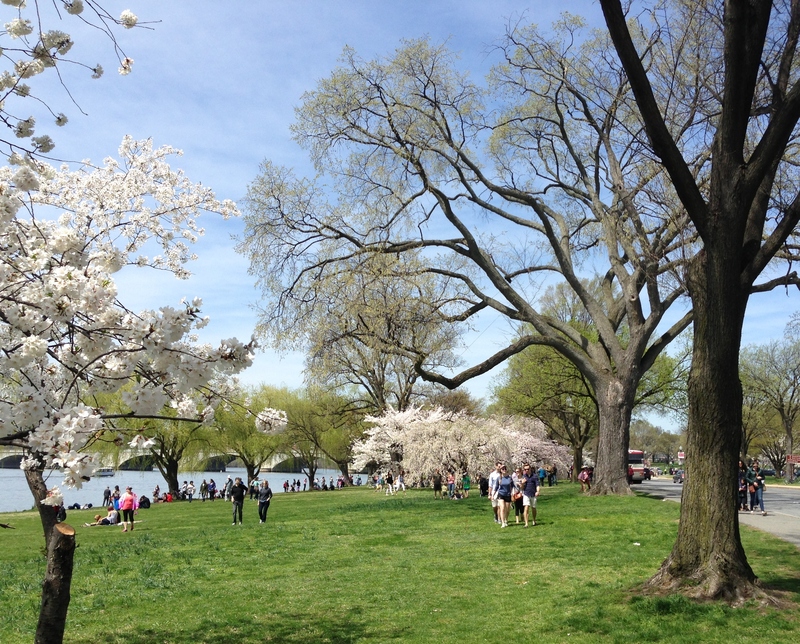 This past weekend, the trees were at peak bloom. 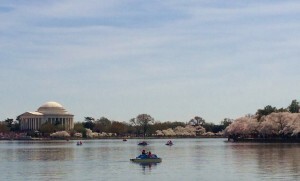 After a winter that threatened never to end, the weather was almost unbelievably perfect. Sunny, warm, slightly breezy. Not hot. 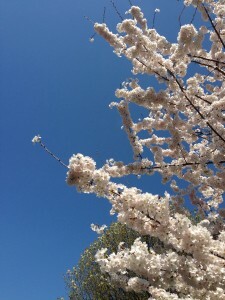 The ideal time to go blossom watching. Ideal, at least, in a less populated world. 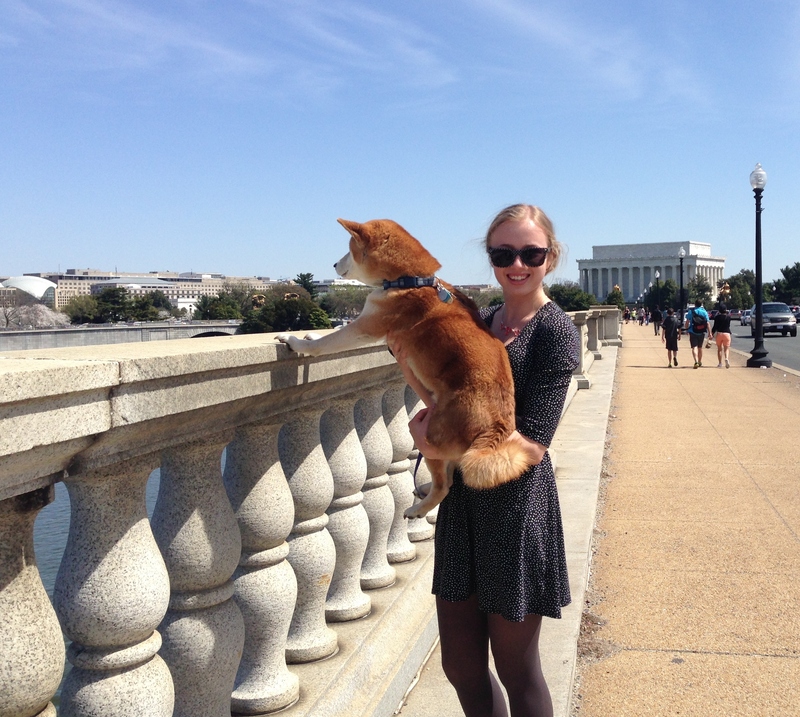 When I suggested a jaunt into DC, our daughter was enthusiastic. But my husband groaned as though he were suffering grievous injury. He had taxes to finish, yard work to do, work emails to face. Traffic would be beyond horrendous. And it was our first chance all year to relax in the comfort of our back terrace. I didn’t press the matter. I agreed with his traffic prediction. 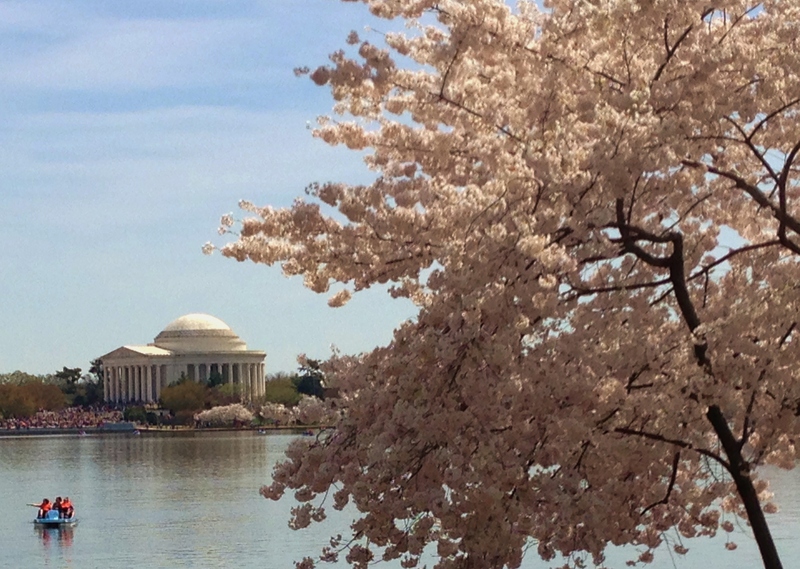 We live eighteen miles from DC. Once, when we drove in during the early hours of Thanksgiving morning, it took us a mere twenty minutes. More typically, it means creeping along for an hour or more on I-66 or the George Washington Parkway. 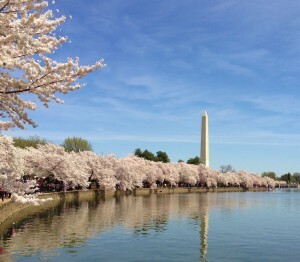 The Metro should be the obvious choice, but parking at the station, especially during cherry blossom season, is problematic at best. Better to stay home. My daughter and I didn’t need further persuasion. I dashed back inside to get Kiko. Walking through a beautiful landscape is not quite complete for me without my little dog. (H and D, however, disagree. They have a lower tolerance for Kiko’s habit of constantly pausing to smell every twig and blade of grass.) Kiko had just settled down to nap. 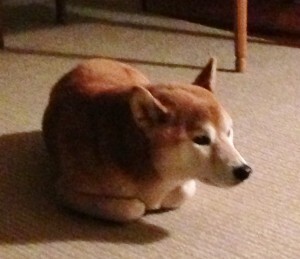 He was lying on the playroom floor looking pathetic, his front paws tucked up under him, like this. The dog appeared stunned when I popped back so quickly and asked his favorite question, Wanna take a ride? It took him a moment, but he roused himself and stretched. Oh yes, he’d gladly take a ride. 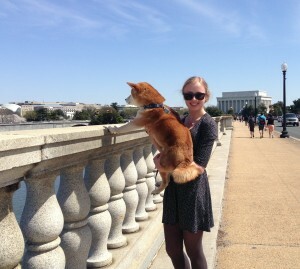 My husband dropped us off just before the Arlington Memorial Bridge. 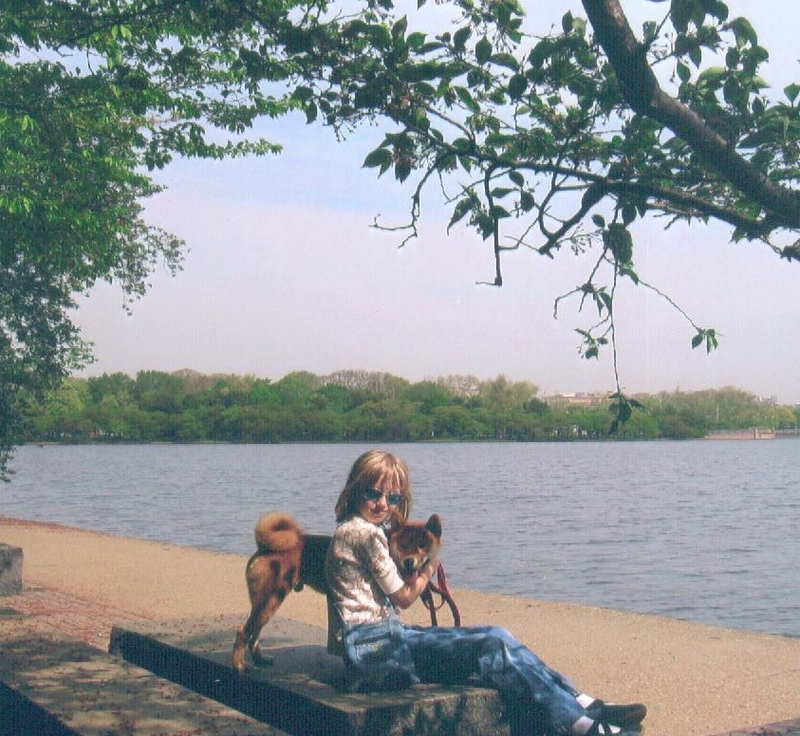 He headed to Crystal City where he could take care of errands and avoid the crowds of cars and pedestrians. 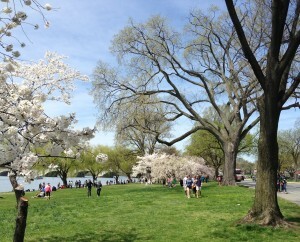 And then, there they were, those justifiably famous cherry trees. They resemble puffs of pale pink cotton candy sprinkled among the white marble monuments. Or paper trees in the magic crystal kit my daughter discovered in her Easter basket one year. Almost too pretty to be real, especially when set against a baby blue sky and reflected in the water. Worth enduring the slow-moving throngs. Perhaps even more often than every seventeen years.